I am a qualified Speech Level Singing Teacher, certified by Seth Riggs to teach Speech Level Singing(SLS)™. I am totally passionate and dedicated to encouraging and empowering my students to fulfil their full potential, and achieve their goals and ambitions. I want all my students to enjoy singing and performing, with their own unique personality and style. I teach both individual and group lessons from my home studio, and at schools around the country. I have had to overcome some serious vocal problems myself and that experience is my best teaching tool, because I can empathise with my students and help them to find a solution to their problems. 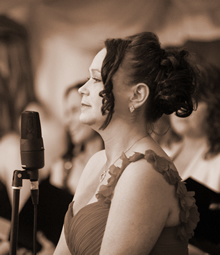 Prior to turning my focus to teaching, I have performed in Jazz, Cabaret & Musical Theatre settings, sung as a featured soloist in big bands, quartets, and duos as well as writing and recording my own material. I still perform in concerts and in a jazz band. Please check out my Gig Listings and recordings.